Download the code for the sample app here. Virtual worlds frequently have many copies of certain elements in the scene: particles, foliage, enemies, and so on. These elements are represented in memory by a single piece of geometry (a mesh) and a set of attributes that is specific to the application. Instanced rendering draws the same geometry is drawn multiple times, with each instance’s attributes used to control where and how it appears. Instanced rendering is also called “geometry instancing”, “instanced drawing”, or sometimes just “instancing”. Below, we discuss how to achieve instanced rendering in Metal. The virtual scene for this article is a pastoral hillside with numerous roving bovines. 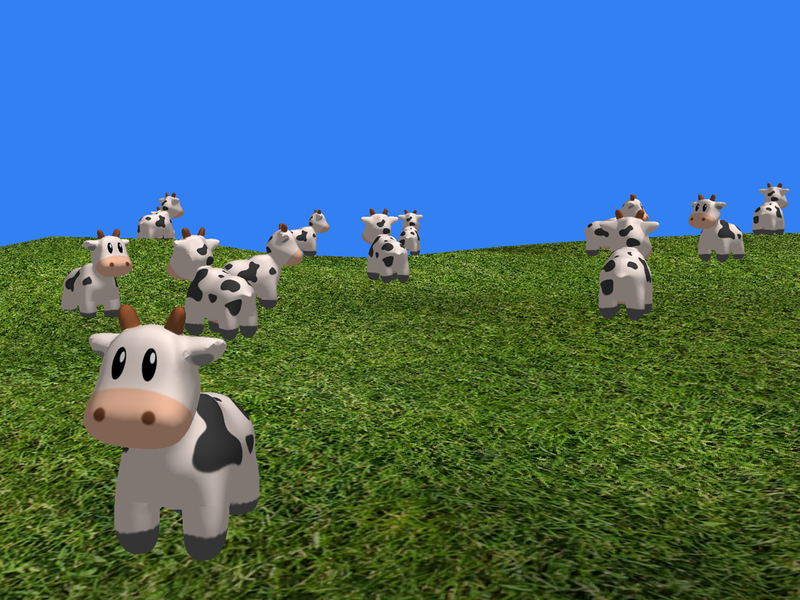 The terrain is uniquely generated each time the app runs, and every cow has its own randomized path of motion. The features of the terrain are created by an algorithm called midpoint displacement, also called the “diamond-square” algorithm. It is a technique that recursively subdivides the edges of a patch of terrain and nudges them randomly up or down to produce natural-looking hills. Since the focus of this article is instanced drawing and not terrain generation, refer to the sample source code if you are curious about this technique (see the MBETerrainMesh class). An interactive demonstration of the technique can be found online here. You can read the original paper on the topic here. We use the OBJ model loader created for previous articles to load the cow model. Once we have an OBJ model in memory, we create an instance of MBEOBJMesh from the appropriate group from the OBJ file. Now let’s look specifically at how we lay out the uniforms in memory. Because we want the cows to move, we store a few simple attributes in a class called MBECow. Each frame, we update these values to move the cow to its new position and rotate it so it is aligned with its direction of travel. To execute this draw call, the GPU will draw the mesh many times, reusing the geometry each time. However, we need a way of getting the appropriate set of matrices inside the vertex shader so we can transform each cow to its position in the world. To do that, lets look at how to get the instance ID from inside the vertex shader. The rest of the vertex shader is straightforward. It projects the vertex, transforms the normal, and passes through the texture coordinates. You can store any kind of data you want in the per-instance uniform structure. For example, you could pass in a color for each instance, and use it to tint each object uniquely. You could include a texture index, and index into a texture array to give a completely different visual appearance to certain instances. You can also multiply a scaling matrix into the model transformation to give each instance a different physical size. Essentially any characteristic (except the mesh topology itself) can be varied to create a unique appearance for each instance. You can move around in the sample app by holding your finger on the screen to move forward. Turn the camera by panning from left or right. In this brief article, we’ve seen how to draw multiple objects in a single draw call. Using instanced rendering allows you to efficiently reuse geometry while populating your virtual world with characters and environmental effects. You can alter the appearance of instances by passing per-instance data in a buffer, which can be subsequently accessed in your vertex shader and used in whatever way you see fit. This technique allows us to utilize the full power of the GPU to render dozens of animated characters very easily. A question about the framerate: using iOS 8 base SDK I’m getting around 48 fps on an iPad Air, but with the iOS 9 base SDK it’s only 5 fps. Looks like something significant changed under the hood. Any chance you will revisit the example code? I sure will! Thanks for bringing this to my attention. Hi Warren, thanks so much for an excellent site. I noticed that setting stepFunction to MTLVertexStepFunctionPerInstance seems to also work fine and is perhaps more efficient although I didn’t see any speedup. Like the commenter above I’m also seeing not-so-great performance on an iPad Air 2, iOS9. The demo runs at 30fps with each frame taking ~28ms GPU time. As an aside, do you understand the stepRate param? The docs mention it only briefly and somewhat circularly. On my iPad Air 2 adding these additional step functions for the other buffers *more than doubles* the rendering speed. 10,000 textured particles went from ~13ms to ~5.5ms. The easiest way to do this is probably to use an array texture (e.g., texture2d_array, which allows you to have multiple “slices” of texture data in a single texture, which can be sampled by specifying an additional index when calling the sample function on the texture. You would pass the appropriate slice index as another member of your instance data. There is a requirement that all textures in an array texture have the same size and pixel format. Another option is to combine all the textures needed by a draw call into an “atlas,” a single texture that you sample from according to the instance ID or other calculated value. Finally, if you only have a few textures per draw call, you can just bind all of them to consecutive entries in the argument table and select which one to sample from by using the array of textures (distinct from texture arrays) syntax in your shader and indexing into it according to the instance data. Refer to the Metal Shading Language Specification for further details on arrays of textures.